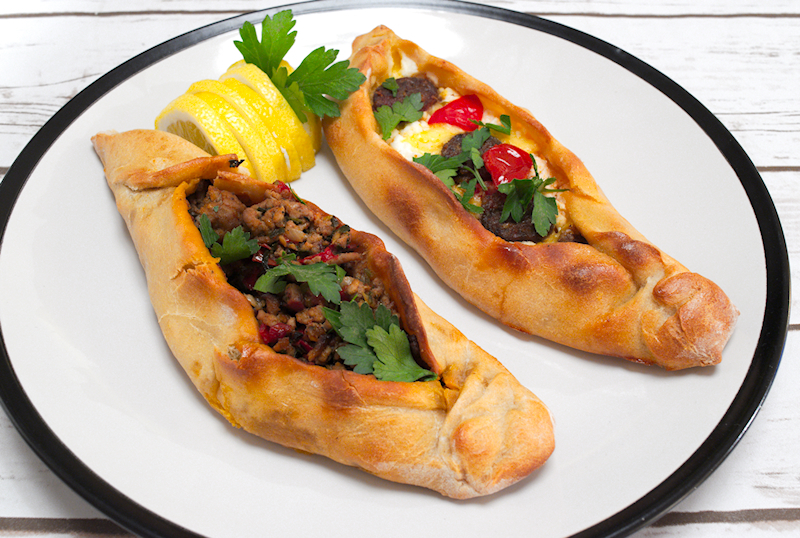 A recipe for authentic Turkish Pide with two different fillings. One for the cheese lovers, and one for the meat lovers. The home-made dough makes all the difference! You may have noticed my interest in pastries and everything that involves dough. I usually take the extra step and make my own dough, making my hands dirty and sticky. It’s good fun though! 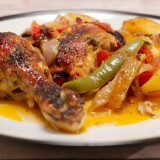 The Turks know a lot about spicy meat and they have a great way to serve spicy lamb on a dough base. They call it Pide and you can say that it can be refereed to as the Turkish Pizza. 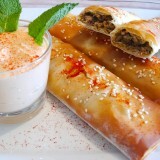 Mince lamb is a classic filling for Pide but you can be creative and use any other filling you desire. As a cheese lover, I seized the opportunity and filled a few of them with goat’s cheese, Feta and Gouda. Yummy! I recently went to a Turkish Deli and felt for a moment that I was in heaven! I got some pastirma (and made some mean omelettes) but what got my attention was the Sujuk (or Sucuk). 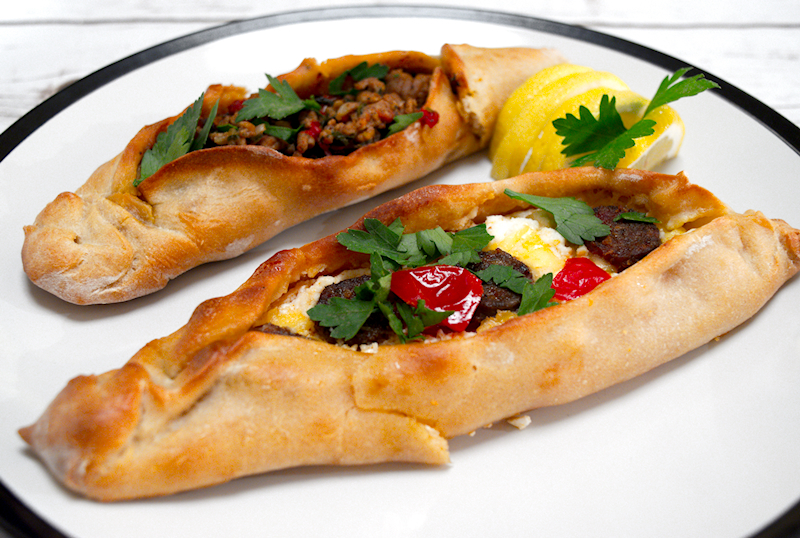 It’s a small spicy Turkish (or Middle Eastern) sausage that is perfect for topping my Pide. You really need to try it. Making the dough may sound like too much work but, trust me, it really is worth the effort. Using ready-made or frozen dough is not the same. I added some Greek yogurt in the dough mixture, which made it quite soft. So, invest some time and you will totally be rewarded! 500 gr (18 oz) all-purpose flour. ~ 2 cups of warm water. 2 tablespoons of Greek yoghurt. 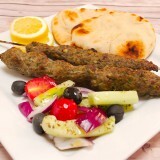 500 gr (18 oz) ground lamb. 1 red pepper finely chopped. 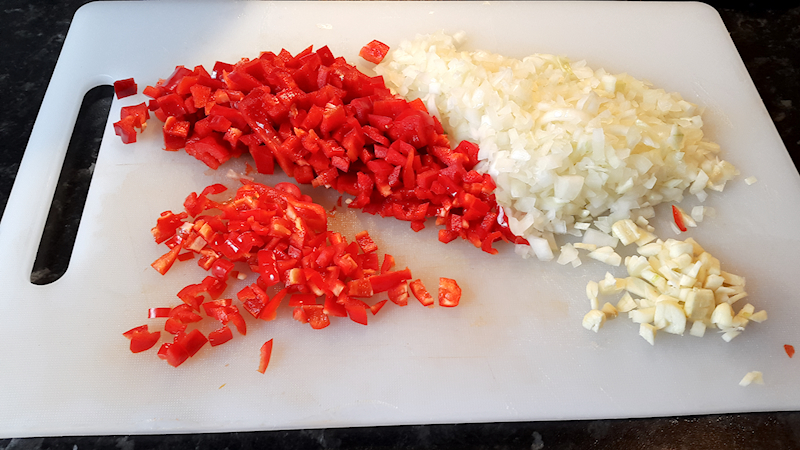 2 red chilies finely chopped. 3-4 garlic cloves finely chopped. 3-4 sweet and ripe tomatoes cut in small cubes. 200 gr (7 oz) of goat's cheese. 150 gr (5 oz) crumbled Feta cheese. 100 gr (3 oz) grated Gouda or Cheddar. Add the yeast, 1 cup of warm water and 1 tablespoon of salt in a bowl. Mix well and let it breath for ~ 10 minutes. Add the flower, ⅓ cup of the olive oil, one egg and yoghurt to the bowl. Add 1 cup of warm water and start kneading. Add more water if needed. Knead for ~ 10 minutes until the dough does not stick to your fingers. Cover the dough with cling film and let it rise for ~ one hour. Add 2 tablespoons of olive oil in a large frying pan on medium heat. Start cooking the mince lamb. Add the cumin, chili powder and oregano. Season with salt and pepper to taste. Stir well. Add the onion, garlic, red pepper and chilies. Cook until they start getting soft and the meat is brown. Add the chopped tomatoes (save some for the cheesy version) and parsley (save some for topping at the end). Cook on low heat until the juices have reduced. You may add a teaspoon of tomato paste if you like. For the cheesy Pide, mix the goat cheese, Feta, Gouda and tomato cubes all together in a bowl. Place a large piece of kitchen foil on the bench. Spread some flour on the surface. Take a piece of the dough (the size of a golf ball) and use your fingers to enlarge it to create the dough base for your Pide. 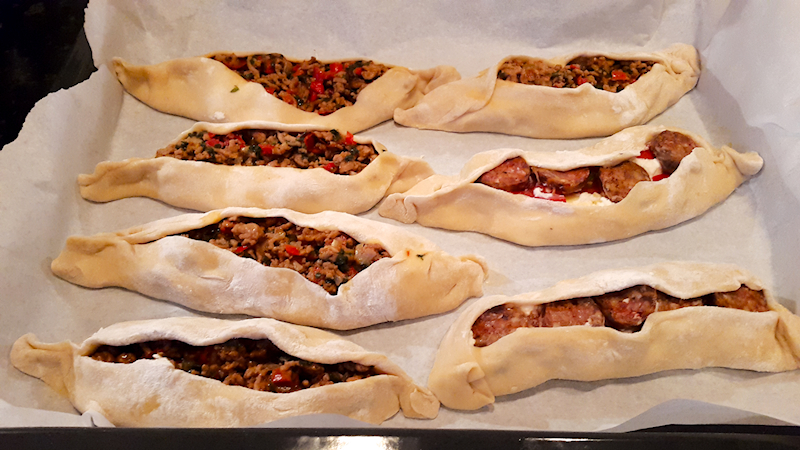 Add some of the mixture in the Pide and close it to form a “gondola”, as it shows in the pictures. 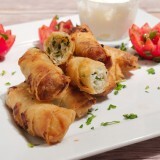 For the cheesy ones, add 3-4 slices of sujuc on top of the cheese filling. 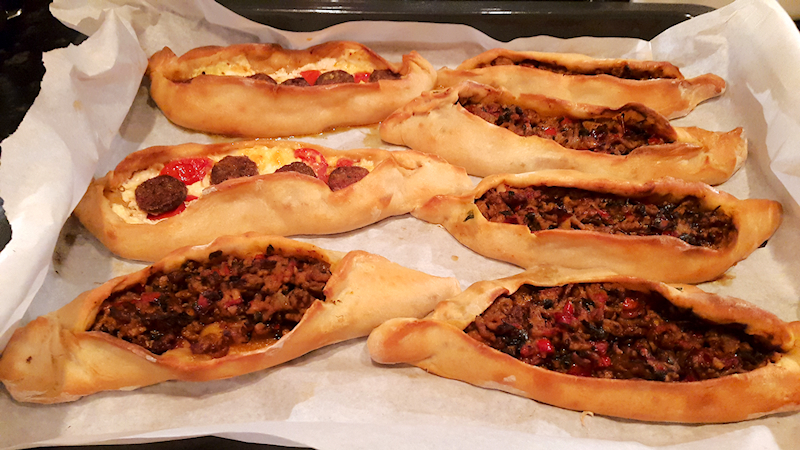 At the end, you should have ~ 10 Pide, meaty and cheesy ones. Spread some olive oil on a tray and place the Pide. Whisk an egg in a bowl and spread it on top of the Pide using a kitchen brush. Cook at 180 Celsius (360 F) for ~ 20 minutes until they turn golden brown in colour.